Have you ever been confused about what you're going to do with your degree or why you are studying so hard right now? Some students feel overwhelmed in their second or third year about what they will end up doing at the end of their degree. People worry about finding employment and sometimes feel like they need to switch programs or degrees in order to meet the demands of the job market. Something I always ask students when they approach the Resource Centre with these issues is to think about why they chose this route, why they enjoy what they study, and lastly why they would want to change what they enjoy just because it may be a bit harder to find a job? In order to calm them down and reassure them that there are many opportunities for every area of study, we have the Degree Exploration Guides (DEGs). These lovely cards are a run down of what "Career Options" you have (not all are listed but their is just enough variety for the student to see that there are many options). They also include "Degree Specific Skills" that can be talked about in the students resume and cover letter. These skills help explain why a person from a certain degree could fit into different roles and professions other then the obvious ones. The DEGs also include web links to Professional Associations, Job Search Resources, Internships and Volunteering. After these have been explored by the student they become even more reassured about the opportunities that are really out there. Sometimes it is just a matter of opening your eyes and thinking more about what skills you have learned from studying your degree (such as time management, organization, communication, etc.) and not necessarily every bit of content you were taught. 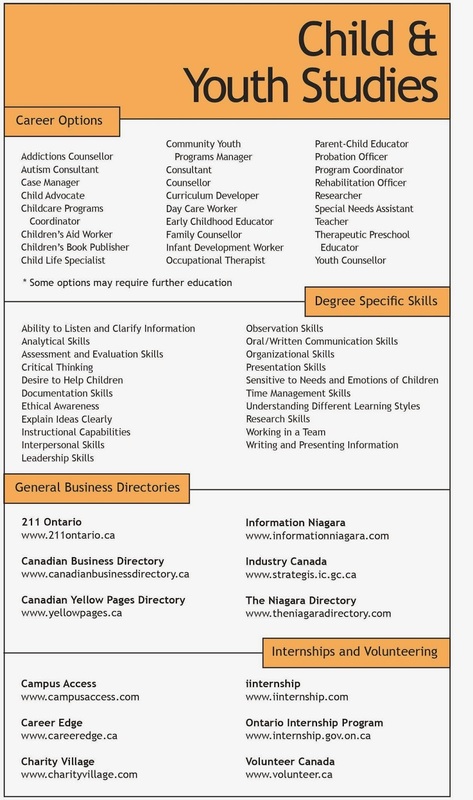 Below is an example of of Degree Exploration Guide with the Child and Youth Studies degree.